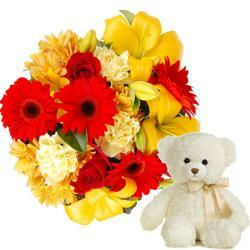 12 Yellow Carnation Hand bunch along with 6 inch Teddy bear. 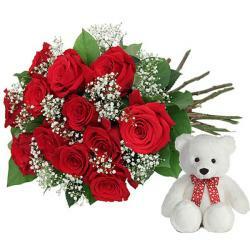 Giftacrossindia.com brings to you this awesome combo. 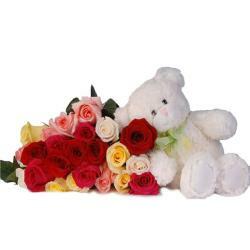 It contains 12 Sunshine Yellow carnation Bouquet, small teddy bear of size 6 inch. This soft teddy is Made of Finest Fur so it is a Best gift for children truly delightful for special ones on special occasions like Birthday, Daughter Day , Childrens Day,Valentine Day and Many more.